Kate Saunders, the author of a number of books for children and adults, introduces Victorian widow Laetitia Rodd in her first mystery. After her clergyman husband’s death, Letty moves to an unfashionable part of Hampstead, London where she rents a townhouse from Mrs. Bentley. Letty’s brother Fred, a barrister, pays her to make discreet inquiries for his clients. Letty is sent to the Calderstone estate, Wishtide, as a governess to the young ladies of the house, although she’s really there to investigate the background of Helen Orme, a widow that young Charles Calderstone is determined to marry. Naturally, there is a murder or two, and hints of scandal. Letty, her brother, and Letty’s inquisitive landlady use their skills and contacts to unravel the mystery and save an innocent man from death. Appealing, well-developed characters, clever plotting, and a variety of settings, from drawing rooms to London inns, a prison, and the kitchen of Letty’s home add to the charm of this debut British cozy. I look forward to enjoying more books featuring Mrs. Rodd. Another very satisfying visit to Victorian England as Charles Finch and his colleagues at their London detective agency ponder the disappearance of a German pianist from a theatre dressing room and worry about their business. Charles and his wife Jane are concerned about Charles’ brother Edmund, a member of parliament. He’s in mourning, and waiting for his sons to hear of their mother’s death. In their hometown in Sussex, Charles is able to distract Edmund by asking for his help investigating recent thefts and odd occurrences. The writing is richly detailed; I enjoyed the descriptions of the brothers out riding and interacting with townspeople, and Charles’ occasion frustration with communication with London only by letter or brief telegrams. Charles gets a glimpse of the depth of Edmund’s grief, and this draws them closer together. An attack on a local dignitary leads to dark secrets about his past, and Jane and her friend Toto help the men with the investigations. While the mysteries are clever, it’s the setting and the continuing development of the appealing characters that makes this mystery series a personal favorite. The first book is A Beautiful Blue Death. 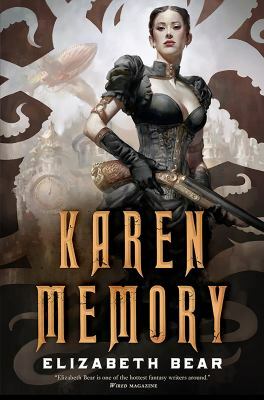 I’ve read only a few steampunk novels, but I really enjoyed this fast-paced steampunk adventure. It’s set in an alternate 1878, in Rapid City, somewhere in the Pacific Northwest, complete with airships and mechanical marvels. Karen Memory finds the best job available to her after her father’s death, and works as a “seamstress” at the Hotel Mon Cherie, run by Madame Damnable. Karen really is a seamstress on the side, but the hotel is a respectable bordello. The ladies gather in the parlor for a meal after their guests leave, and are surprised when Merry Lee shows up, badly wounded while rescuing Priya. Priya and her younger sister came from India for work, only to be trapped by powerful bully Peter Bantle, who wants to be the next mayor. Karen falls hard for the brilliant Priya, and wants to rescue her sister. Next Deputy Marshal Bass Reeves rides into town looking for a killer, and Madame Damnable’s girls volunteer to help along with Merry Lee, hoping the trail leads back to Peter Bantle. Lots of action and adventure in a very unusual setting, with an appealing narrator in Karen. On November 14,1889, Nellie Bly, an investigative reporter for the New York World, left New York City on a steamship headed east. Her goal: to travel around the world in 75 days, outdoing Jules Verne’s fictional Phileas Fogg. Traveling by steamship and train, she briefly visited several points in Europe, even meeting Jules Verne in France, then headed through the Suez Canal for points east, observing and commenting on the British Empire in the Victorian era. Traveling with only one small bag, she took the world by storm, visiting Ceylon, Hong Kong, and Japan. Half-way around the world, she was informed that journalist Elizabeth Bisland was traveling in the other direction, in a last-minute attempt by her publisher to beat Nellie Bly. Elizabeth sets out for the American west, on the new transatlantic railroad, a Southern literary critic surprised to be blazing a trail for American women. The story of their eventful journeys and the aftermath make for a great armchair travel experience for the reader. Terry Pratchett is best known for his humorous fantasy series set in the Discworld. Some of them, with young witch Tiffany Aching and the tiny gnomes known as the MacFeegles are written for teens, as is Dodger, but this book is set in Victorian era London. Dodger, 17, is a tosher who scavenges for coins and other lost treasures in London’s sewers. One night he hears a scream and climbs out of the sewer to rescue a young women from thugs. Newspaperman Charlie Dickens is next on the scene, along with another gentleman and they take Simplicity and Dodger to a safe house. Dodger is smitten, and agrees to look for the thugs. Dodger’s landlord, an elderly Jewish jeweler, takes him to get a suit and recommends a shave. Of course, the barber is the murderous Sweeney Todd, who is caught by Dodger, who later interrupts a robbery at Dickens’ newspaper. 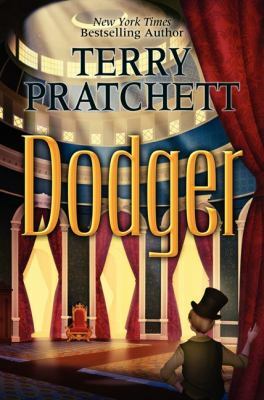 The plot just gets more complicated from there, with Dodger and Simplicity having numerous adventures, but it’s definitely fun going along for the ride and enjoying glimpses of life in London from all angles. Even the bits in London’s sewers make for fascinating reading. Funny in parts, sad in others, well worth a look for readers of historical fiction or humor. James A Garfield was clearly a brilliant man, and one who had no interest in becoming president. He was a college president, a Civil War general for the Union who became a congressman, and was an advocate for freed slaves as well as an inspiring speaker. In 1880, Garfield gave a speech nominating John Sherman, the brother of General William Tecumseh Sherman, at the chaotic Republican convention, although the most notable candidates were James G. Blaine and Ulysses S. Grant. The convention became deadlocked and took two days to nominate a candidate for president. Remarkably, James Garfield became the nominee, won the election, and took office in March, 1881. He hired the youngest private secretary in history, Joseph Stanley Brown, age 23, who later married the president’s daughter Mollie. Brown was the only one who could turn away the long lines of office seekers who appeared at the White House daily, including Charles Guiteau, a failed lawyer who wanted to be the French Ambassador. On July 2, 1881, he shot the president as he entered a train station. The president died on September 19, and Guiteau was tried for murder. He used an insanity defense, and also stated that while he shot the president, he did not kill him. Guiteau was absolutely correct, as Garfield died of malpractice. Candice Millard relates the fascinating story of Garfield’s life and family, the misguided pride of Dr. D. Willard Bliss, the valiant attempts of Alexander Graham Bell to locate the bullet, and the surprising legacy of one of our most overlooked presidents, the last to be born in a log cabin. I found this book to be fascinating, and at only 260 pages, it’s a very readable look at a time when the election (and protection) of presidents was very different from today. For more about Garfield and the book, visit the author’s website. If you haven’t yet discovered the Charles Lenox Victorian mystery series, you’re in for a treat. You’ll want to start with the first book, A Beautiful Blue Death, but I’m going to tell you about the latest book. Charles Lenox is a new member of Parliament in 1873 when his brother, Sir Edmund, asks Charles to travel to Egypt to quietly investigate the deaths of several British agents. Charles settles into his cabin on the Lucy, where his young nephew Teddy is making his first voyage as a midshipman. The given reason for the voyage is for Charles to meet with Egyptian officials and tour the Suez Canal. Soon after leaving England, a lieutenant is killed, and Captain Martin asks Charles to investigate. A private detective before he was elected to parliament, Charles worries that he won’t find the murderer in time, and interviews everyone he can, from ship’s officers to stewards, to ordinary seamen. There are hints of mutiny, and ultimately an exciting confrontation with some suspects. When they reach Egypt, the suspense doesn’t let up, making for an interesting mixture of historical mystery, adventure at sea, and spy story, with a little romance thrown in as Charles is missing his new wife very much. I enjoy reading this series because the setting is interesting, the characters are memorable and change over the course of the books, and the mysteries are clever. The earlier books in the series also feature Charles’ neighbor and best friend, Lady Jane Grey, along with his butler Graham and his detective protege John Dallington. The reading order of the series is: A Beautiful Blue Death, The September Society, The Fleet Street Murders, A Stranger in Mayfair, and A Burial at Sea. The entire series is also available on compact disc. You may also enjoy The Pirate King, by Laurie King, a historical mystery about Sherlock Holmes and Mary Russell that includes pirates and a movie about a Gilbert and Sullivan show.